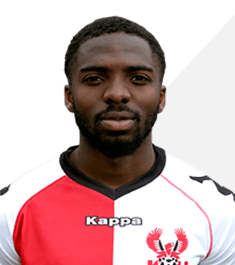 London born Emmanuel Sonupè joined the Harriers towards the end of the 2016-17 season on a remainder of the season loan from Northampton Town. Once on the books of Tottenham Hotspur he joined St Mirren on loan before leaving White Hart Lane for the Cobblers. The wide playing midfielder returned to the Harriers on a permanent basis at the end of June and stayed with us for one more season before joining Stevenage for an undisclosed five figure fee.